The 7.8 Magnitude Gorkha Earthquake struck in April 2015 completely destroyed 495 schools including 3092 class rooms of Gorkha (DLPIU, Gorkha). 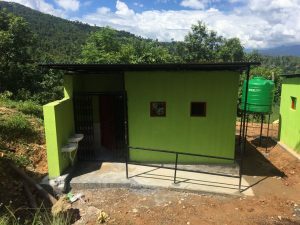 GNI Nepal initiated a special ‘Gorkha reconstruction project’ provided financial, technical and other required support for the reconstruction of 7 schools of Gorkha District. 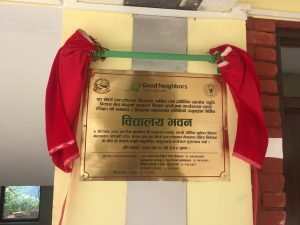 The re-construction of Shree Saraswati Secondary school – one of the seven schools, was completed on 29 June 2018 at a total expense of 2.6 million rupees contributed by GNI Nepal and school contribution of One hundred twenty five thousand rupees. The newly constructed School now has a two- storied building consisting of four rooms and a second two-storied building consisting of eight rooms, two units of Gender-friendly toilets, one computer lab with 12 desktops, a laptop and a projector, a fully furnished science lab, a library, school furniture’s and carpets for primary level classrooms, a ‘Child-friendly drinking water system’ and Gavin fencing around the school compound. 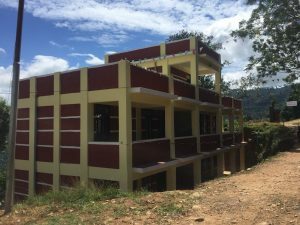 On 7 September 2018, the inaugural ceremony of Shree Saraswati Secondary School of Phinam, Gorkha Municipality Ward No. 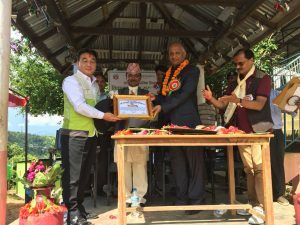 4 has been graced by Honarable Ram Sharan Basnet, Minister – Physical Infrastructure Development as the Chief guest and Mr. Rajan Raj Pant, Mayor – Gorkha Municipality along with Mr. Min Ho Choi, Country Director of Good Neighbors International Nepal as special guests. The program was chaired by Mr. Khop Bahadur Adhikari, Ward Chairperson of Ward No. 4, Phinam, Gorkha. The program saw a participation on approximately 400 students, parents and community persons along with representatives from media. A total of 261 students and 21 teachers are believed to be immediately benefitted with the newly constructed buildings, facilities, laboratory and library.